ORLANDO, FL--(Marketwired - July 05, 2016) - uBreakiFix announced significant growth for the second quarter of 2016, boasting a total of 27 new stores, three of which were in new markets for the brand. The company ended the second quarter with 212 locations across North America. 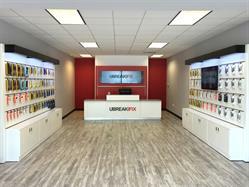 uBreakiFix closed the first quarter with 24 new stores and had a total of 186 locations entering the second quarter. It also hit a milestone on May 23 with the opening of uBreakiFix Davie, the company's 200th location. "We owe it to all of our amazing franchise teams in Davie and beyond, and to our home office for making it possible to reach this milestone," said Justin Wetherill, co-founder and president of uBreakiFix. "We are also grateful to our customers for allowing us to become their trusted resource for repairs." Between April 1 and June 30, 2016, uBreakifix grew from 186 stores to 212. Second quarter expansion included opening nine new stores in the company's home state of Florida, as well as three locations in Texas and three in the metropolitan Denver area. "We grow with our vision always at the forefront of everything we do," said Wetherill. "We know that damaged tech can ruin someone's day, but we don't think it has to. With that in mind, we create a hassle-free experience for our customers to get their tech back in order." The fastest-growing markets for the brand include Florida, Orange County, California, and the greater Chicago area. Between July 1 and Sept 30, uBreakiFix plans to open 31 new stores in existing markets and new markets like Boston, Sioux Falls, South Dakota, and Vancouver, British Columbia. "We have a vision to see uBreakiFix expand its reach and ability to serve consumers around the world," Wetherill said. "We believe our rapid growth can be attributed to our excellent service and systems and the people who make the processes work, and we appreciate everything that our team does." The company plans to have 243 stores by the end of September 2016. By the end of 2016, the company plans to have 275 corporate and franchise locations in operation, bringing the goal for 2016 store openings to 113.
uBreakiFix specializes in same-day repair service of small electronics, mending cracked screens, water damage, software issues, camera issues and most other technical problems in its stores. uBreakiFix was founded in 2009 by a savvy millennial duo, Justin Wetherill and David Reiff, who married their skillsets with Eddie Trujillo to offer a brick and mortar alternative tech repair option that was quick, affordable and provided a quality customer experience. By filling a gap in the repair marketplace, the company has grown organically without debt, investors or consultants. Founded in 2009, uBreakiFix specializes in the repair of small electronics, ranging from smartphones, game consoles, tablets, computers and everything in between. Cracked screens, water damage, software issues, camera issues, and most any other problem can be repaired by visiting uBreakiFix stores across the U.S. and in Canada. For more information, visit ubreakifix.com. uBreakiFix announced significant growth for the second quarter of 2016, boasting a total of 27 new stores, three of which were in new markets for the brand. The company ended the second quarter with 212 locations across North America.